These wines are constitutive of the current 'best-practice' in viticulture and old world winemaking: small lots, bin fermentation and as little mechanical intervention as is humanly possible. No huge stainless steel vats, no mechanical pumpovers. Being 'hands on' without doing harm and just letting the grapes do their thing. Opaque bright dark violet color. Bright aromas and flavors of coffee, chocolate mousse, and dried sour cherries with a glycerous, lively, dryish medium-full body and a warming, amusing, buoyant spicy berry-orange relish, vanilla nuts, cedar, and earth finish with chewy, woody tannins and moderate oak. A nice oaky red blend with interest and complexity. 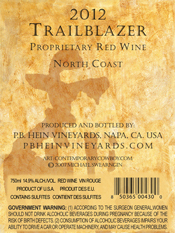 Gently pressed from grapes planted, grown and tended by PB himself on the Hein family ranch in the Deer Park area of St.Helena (just below Howell Mountain).Opaque garnet black color. Rich aromas and flavors of cassis, pie a la mode, honey cream, nougat, and dried cherry with a silky, lively, fruity medium-to-full body and a smooth, engaging, long finish with impressions of nuts, vanilla, and sweet and peppery spices with well-integrated tannins and light oak. 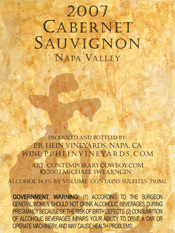 A delicious and seamless Napa cabernet that is sure to please. 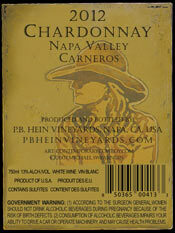 PB HEIN PREVIOUS VINTAGES - SOLD OUT! P.B. 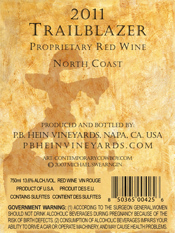 Hein Vineyards Celebration Red: The personalized gift of wine for any occasion. 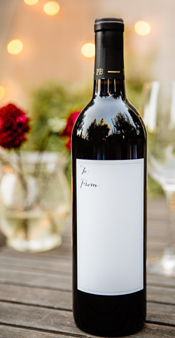 Add your own special message or artistic touch on the blank front label and this bottle instantly becomes a memorable keepsake gift for any special event, occasion or holiday. 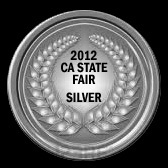 Wine is for celebrations and this delicious blend of fine California reds is sure to please any crowd. We would love to see your creative label designs, so please visit us online and share a photo of your unique bottle on our Facebook or Twitter or Instagram pages and automatically be entered in one of our seasonal label design contests where you can win great prizes! A big red blend with hints of tobacco, bacon and spice. 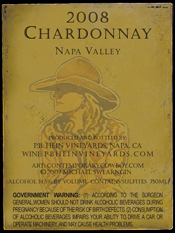 A beautiful Chardonnay from the Carneros region of Napa Valley. Golden straw coloring. Aromas of vanilla, honeysuckle, butter, oak spice, creme brulee, pear, apple and nutmeg. Slight pineapple and citrus florals. Light to moderate body and acid. Gently pressed from grapes planted, grown and tended by PB himself on the Hein family ranch in the Deer Park area of St.Helena (just below Howell Mountain). 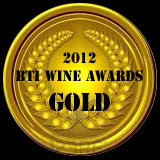 Gold Medal at the 2012 BTI Wine Awards! 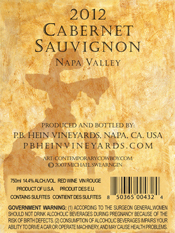 A delicious and seamless Napa cabernet that is sure to please. Carefully crafted from syrah grapes grown in the Vernasco Vineyard on Suisun Valley Road (pronounced "Soo Soon" - which borders Napa Valley immediately to the South), these grapes are a favorite of our winemaker who won his first gold medal at the Napa Town and Country Fair with a syrah produced with grapes from the same vineyard. 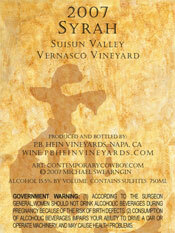 Not your typical California Syrah. Light reddish, purple hue and light opacity. The nose carries a blend of violets and roses with light notes of black berry, cola, earth and dried herbs. 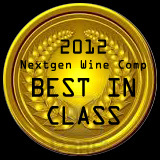 On the palate, the entry is light and elegant with sweet cherry and blackberry carried by light acid and soft tannins. 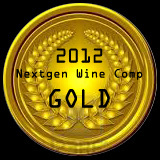 Amazing wine for the $$! 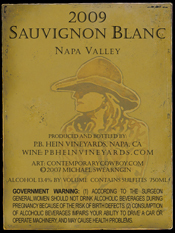 Gently pressed from grapes planted, grown and tended by PB himself on the Hein family ranch in the Deer Park area of St.Helena (just below Howell Mountain). Velevety and full bodied; a medium rich Cabernet with a distinctive nose, and flavors of black currant, cherry, toast, and spicy oak. Long, mildly tannic finish. Carefully crafted from syrah grapes grown in the Vernasco Vineyard on Suisun Valley Road (pronounced "Soo Soon" - which borders Napa Valley immediately to the South), these grapes are a favorite of our winemaker who won his first gold medal at the Napa Town and Country Fair with a syrah produced with grapes from the same vineyard. 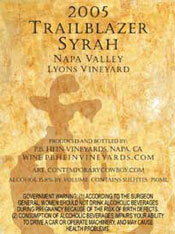 A smooth and delicious Syrah--especially at the price. Aromas of blackberry jam and oak on the nose. Pleasent entry and body with notes of ripe berry fruit. Pairs well with many different types of dishes including BBQ. 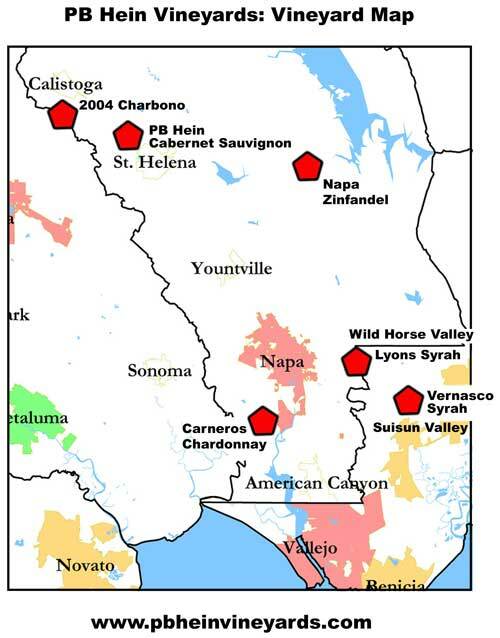 The Lyons Vineyard is located high in the slopes of the Wild Horse Valley and produces small berries in loose clusters similar to the cabernet grapes PB is used to working with. It cosists of 3 blocks from 1,531 - 1,660 feet of elevation and the south-east facing provides a low yield, high quality syrah. Dark garnet; youthful aromas: licorice, blackberry, leathery notes, dried fruit; big, ripe, young, clean, slightly oaky, blackberry fruit flavors; rich, medium to medium-full body; good balance; firm tannins with a moderately long finish. Lush aromas of citrus and pineapple on the nose. Deep garnet red color; complex, age-worthy aromas: tobacco, molasses, cinnamon, cloves, anise, black pepper, and cooked prunes with nuances of fresh strawberries, cherries, blackberries and currants; large, young red wine with strong tannins in the mid-palate and a reasonably long finish with distinctive toasted oak flavors. finish that lingers with a prominent toasted oak flavor. A supple, full-bodied, complex wine. 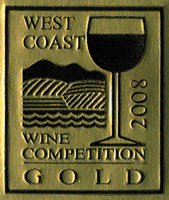 Richly flavored, with notes of black cherry, tea, and oak, and a hint of bitter almond on the finish. The Charbono grape of California is a cousin to the French Corbeau variety of the Savoie region. Charbono grapes make a silky, deep purple, moderately acidic wine, which hits its peak after aging for 10 to 20 years. 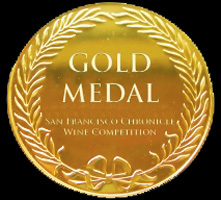 Carefully crafted from syrah grapes grown in the Vernasco Vineyard on Suisun Valley Road, these grapes are a favorite of our winemaker who won his first gold medal at the Napa Town and Country Fair with a syrah produced with grapes from the same vineyard. Darkly colored for a rose; light red. Full flavored, dry, and quite intensely flavored; a rose with depth and light tannin, tasting of boysenberry and cherry, with slight peppery overtones. Long finish.